Around these parts, when someone brings up barbecue chicken, everyone thinks of Jerry. It's the best ever barbecue chicken. Sadly, Jerry does not have a restaurant. Or, maybe that's a good thing. That makes it extra special when you see a sign go up around town that a group is having Jerry's BBQ Chicken. It's one of those deals where you go home and mark it on the calendar. You don't want to miss out. And, you don't want to go late and chance that they sell out before you get there. Basically, you just have to ask around in Cleveland, Woodleaf, or Scotch Irish in western Rowan County, NC. 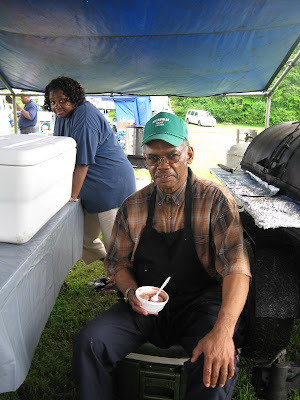 Folks know Jerry and can tell you how to get up with him about chicken barbecue. 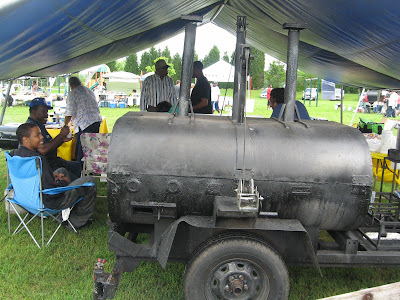 Jerry had his big smoker out at the Cleveland Spring Festival today. 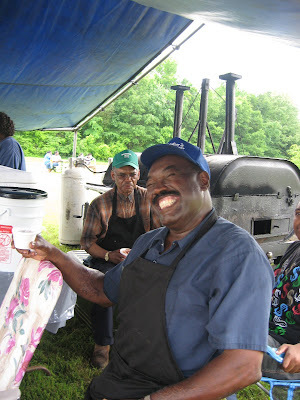 He was cooking up his delicious chicken as well as hamburgers and hot dogs. This is Jerry! Not only is he one heck of a chicken smoker, he's a really funny guy. I've worked once with a church chicken fundraiser where Jerry was the chef. It wasn't even like work with Jerry there. He honestly doesn't know a stranger, and he can get everyone going and having fun doing it. A lot of the chicken dinners are for charity. Instead of having people who really don't know how to grill or smoke wing it, groups will hire Jerry to do the chicken. Then, it's done right and lots of people come out. 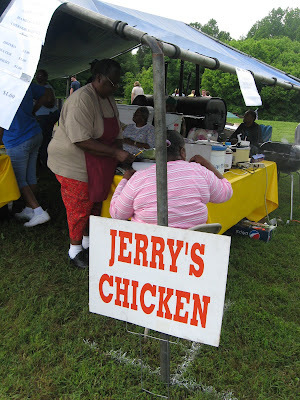 I have to give a shout out, because Jerry made chicken for Cleveland Methodist Church. The roof was leaking and wrecking the floors and furniture. It was pretty desperate and a small congregation. Jerry cooked, and we all helped. Then, more volunteers form various churches came out and helped put on a new roof. That's one thing I can say for a small town. People will pitch in when needed. This is Jerry's brother who was working hard on festival day. I think he must be the older brother. He's a lot more serious than Jerry. Very nice guy. Just not into silliness or shenanigans. So, hi Steven! And, that's some great chicken you guys smoke up. Yummy hot dogs and burgers too.